I have a love-hate relationship with the voice recognition feature on my cell phone. When I first brought home my adorable Project Red Motorola RAZR almost two years ago, I was quite excited to graduate to a big-girl phone. Using the Voice Recognition feature was fun at first. I would say, “Call-Jim-work” and then the lady in my phone would say, “Did you say, ‘Call-Jim-work’?” I would firmly but politely confirm, “Yes.” She would say, “Calling!” Magically, my husband was on the other end of the line in seconds, without my having to lift a finger! This was awesome! The lady in my phone and I got along well. I didn’t even mind her constantly confirming what I was saying. Then I got frustrated. WHY couldn’t she just “get it”? I mean, seriously. I call the same people all the time. Isn’t there software for the purpose of Recognizing That Melisa Is Calling “Him” or “Her” Again??? I found myself trying to say the names of my contacts in a convoluted way—just like the lady in my phone does—to avoid the confirmation. It became a game: could I say a name in just the right way so that she dialed for me without asking me what I said? When I was successful (rarely) and we skipped right to “Calling!” I would shout “Sweet!” and pump my fist in the air triumphantly. I finally was able to master one name, my sister’s, and the lady and I had an understanding. Apparently all my life I have said my sister’s name wrong: I’ve been saying “Julie” instead of “Jah-oh-leeeee”. My mistake. Now, every time I want to call my sister, all I have to do is contort my mouth in the strangest way and say “Jah-oh-leeeee”, and the lady understands me perfectly. And then I giggle a little bit. As for the other names? Well, the lady in my phone and I will just continue to play tug-of-war with those, because neither of us wants to meet in the middle. Thay-anx fuh-or ruh-eeee-ding thee-is pohhhh-st.
*Don’t misunderstand me, please. Normally I could care less about being “hip”. I don’t go out of my way to look “hip”, buy “hip” products, sound “hip”, or act “hip”. 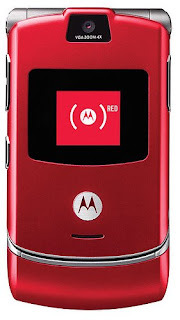 However, I happen to appreciate when something “hip” accidentally inserts itself in my life as my Cherry-colored Project Red RAZR did. Nuff said. P.S. I just posted this over at the Anthill on Cre8buzz. Now that you’re done reading it, throw a comment my way and then head on over to the ‘hill and read what other bloggers are writing! I must say the first time I went to pick up my middle schooler with my blue chocolate phone, the kids thought I was really cool. I’m sure it is already out of fashion, but I was cool mom for a couple of days! BWAHA!! I hate the voice recognition chick on my phone too – I won’t even use it, she NEVER gets it right! LOL! Kat: Trust me, it’s a sight to see! My voice recognition on the phone makes me want to fling my phone across the room! Very, very funny post, and I needed a giggle. BTW–you seem very naturally “hip” to me. I don’t use the voice recognition thing. I never wanted to take the time to figure it out. Your post makes me think – no great loss that I didn’t. But I DO love my pink Razr phone! I love it – love it – love it! I can’t tell you how many exellent quality photos I’ve taken with it. I’ve had mine two years and just bought a new battery for it. I know cell phones have a built-in obsolesence factor of about two years, and I’m hoping I can squeeze more time out of this. ‘Cause I love it. Did I mention that it’s pink??? Next post: Earthquake in Illinois This Morning!